Cosmopolitan seems to have been built with a young woman’s lifestyle in mind. It’s actually the kind of lifestyle that a woman from a big city can expect to have, with clubs, Cosmopolitan drinks, DJs, handbags and great shoes being among the things which the slot mentions with its symbols. The developer behind this game is called Saucify (BetOnSoft), and they managed to create a title which looks good and is fun to play. With 5 reels & 15 bet lines, Cosmopolitan isn’t a game that will promise you a lot of payouts, but the ones that you do get will reach values of up to $12,500. The lines will also host scatter and wild symbols, plus free spins with tripled prizes. 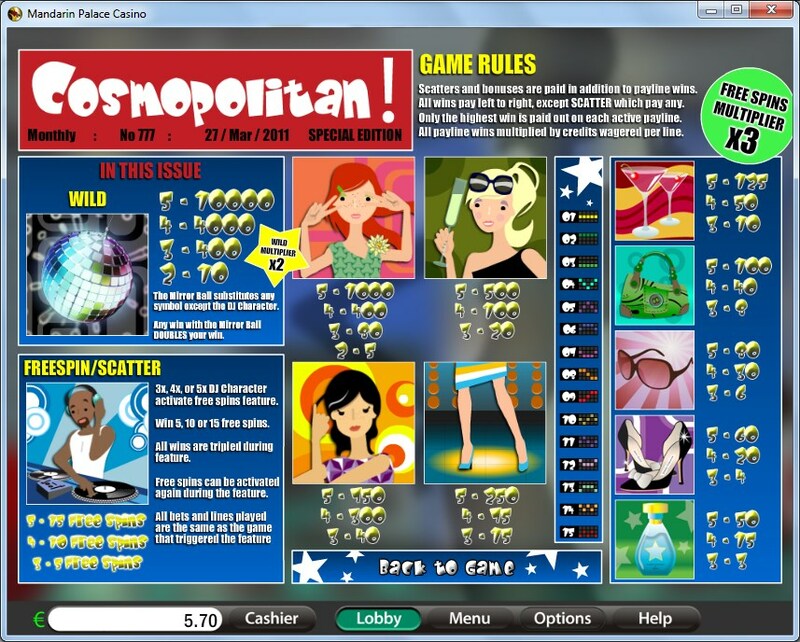 Scatter symbols, free spins, wilds and multipliers, these are all the features you can expect to get in Cosmopolitan, and it’s more than enough for a modern title. A Mirror Ball serves as a wild in Cosmopolitan. The symbol gets the ability to both replace other icons when it lands on the right payline, and it also forms its own combinations and pays as much as 10,000x the line wager. By “the right payline”, I mean that it needs to be active, and the rest of the symbols needed for the combo have to be in place. The wild, if it lands in the spot where one symbol is missing, will take that role and the combo will form. The payout will be doubled as well, a multiplier of 2x being applied by the wild. The game has free spins to offer as well, and they come when enough DJ scatter symbols are present on the reels, no matter where they show up. You will be rewarded with 5, 10 or 15 free spins, or 3, 4 or 5 scatters. All the wins you get along the way will be tripled in value. 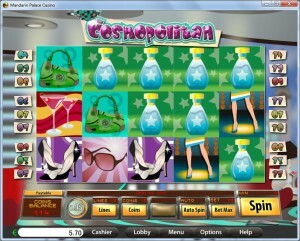 You can retrigger the free spins, with the same 3+ DJs on the reels. The bets don’t use numbers that are rounded up, so a $1.25 line bet ends up being a total bet of $18.75. The line bet uses up to 5 coins, while their values will reach $0.25. With the game awarding payouts of 10,000x the line bet, it’s a much more profitable title than many of the other Saucify slots. The 50,000 coins which can be won have a top value of $12,500. The game focuses on a young woman’s life in the city, so you can expect shoes, sunglasses and handbags, along with a couple of girls that are dancing or drinking cocktails. With the Mirror Ball and the DJ also being part of the symbols, you get the picture immediately that the action takes place in a club. I’ve enjoyed the game’s design even though I’m not in its target demographic, and girls I’m sure will love it even more. Symbols: Mirror Ball (10,000x, wild), DJ (scatter), Redhead Girl (1,000x), Blonde Girl (500x), Brunette Girl (450x), Girl’s Feet (250x), Cocktails (125x), Handbag (100x), Sunglasses (80x), Shoes (60x) and Perfume Bottle (50x). The game has its own target audience, and if you’re in it, and you want to live that kind of life, the slot has plenty to offer you. 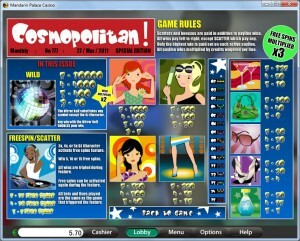 You will find Cosmopolitan at any online casino which chooses to use software from Saucify/BetOnSoft , playable either for free or for real money.